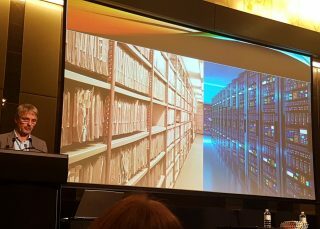 Last week was the annual Australian Society of Archivists conference held in Perth – with a theme of “Archives in a Blade Runner Age” (hence the title of this blog), where I attended my third archives conference in as many years (you can see the tweets from the conference under #asa2018). So she left an AI with each, that took the buckets from them, and only poured in the bits and bytes that were worthy. The Archivist could then cross the Sea to set up her camp, leaving some AIs to hunt down the monsters in the Digital Sea. So she set up the AIs to provide graduated and personal access to each of the supplicants. And yea, verily, forsooth, the Digital Sea was tamed. The cat* was unmoved. 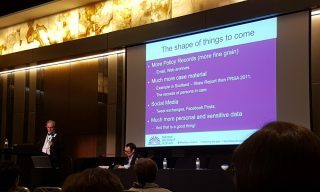 To be clear, the cat references (*) are not me trying to play to stereotypes – this is a direct result of Deb Verhoeven’s (@bestqualitycrab) talk about dogs, cats and sheep – turns out most of the archivist audience were cat people! Firstly, and this is in part due to my own inherent biases (not just Catholic schools, but also being a nerd), I saw a lot of discussion around technology. The keynote at the start from Professor Gillian Triggs had me thinking about technology being a tool, not inherently good nor bad. Her talk was particularly powerful, through the lens of her experiences in the human rights arena. So, with technology firmly there as a tool, there were a few talks about the uses of Artificial Intelligence (AI) and other technologies out there. 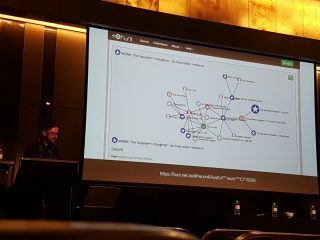 In particular, Tim Gollins’ (@timgollins) keynote from his experiences in the computer sciences indicated that there are a range of different ways that AI (specifically, machine learning) can play a role in assisting the Archives to do their job. I thought that this was neat, but when you couple that with Belinda Battley’s comment that records keeping was a complex, adaptive system (akin to ecology), then the complexity of any task in this area ratcheted up a notch and made AI look like the only real solution. Later, Claire G Coleman (whose book, Terra Nullius, is something I am reading at the moment) had me think about the transition from paper to digital again, and that is where the wave concept came from, and then the Red Sea style reference. The wave of oncoming digital information has to be held back by something, and why not AI? All of a sudden the last few points – tools, technology and the reason for using them – snapped together as Claire asked us to be vigilant. That is a task that I reckon might require quite a lot of effort, and something that perhaps machine learning might help with (if used for good?). 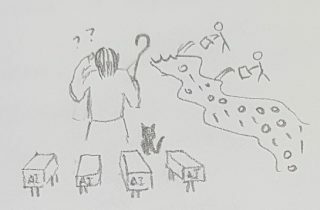 It was in the middle of a talk by Professor Stephen Loo, which followed directly on from Deb Verhoeven’s talk, which started my thinking about sheep and shepherds, that I drew the first “archivist as shepherd” cartoon, which I think is an analogy many would have heard of before. 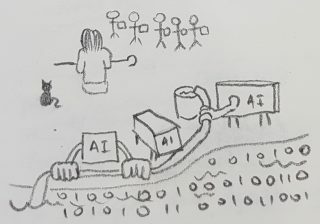 But instead of shepherding records into archives, I drew them shepherding AIs. That had me thinking I had been very sheep-like up until that point, and this sort of “eureka moment” comes from seeing someone like Stephen (who is involved in design, philosophy, art, performance and science) bring a different perspective into the fray. Which led us straight to our workshop for Boostrapping Small Archives. We were trying – really hard – to be pragmatic in the face of so many archives that have individually come to talk to us. So while there’s no way that AI fits into the space of small archive (yet), this is a starting point for the journey. In a sense, these small archives are at the start of the digital river, and we have a way to go until they will need to deal with masses of people with buckets, or raging seas. For now, the Archivist as a shepherd reference may see small archives shepherding paper records, via simple Excel worksheets like the one we provided in our workshop. Of course, there are also other tools that are appearing in our toolboxes – AtoM, ArchivesSpace, CollectiveAccess and Archivematica. All of these tools also come with the blueprints to make another one, i.e. they are all open source. This is particularly important if you plan to pass these tools down to the next generation. There were a range of other things in the talks that I picked up and am already following up on, like the ideas that Julia Mant and Katie Bird put forth around the use of AtoM as the tool for managing the Directory of Archives project, or questions that Chris Hurley put to us in our workshop about having a single place to see what was happening with all of the different software and initiatives out there. 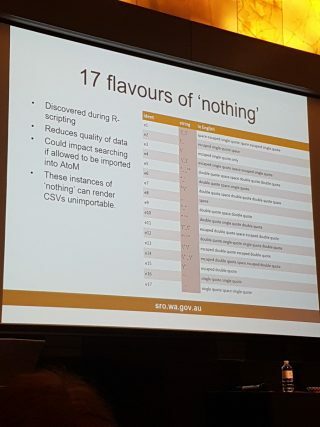 There were quite a few other gems along the way, too – like Michael O’Connor’s wonderful “17 flavours of nothing” slide. As I was writing this blog after the conference, it seemed to me that we’re standing on the cusp of something great here. Unlike what I saw happen to the spatial industry – which was swallowed up by other industries and is now no longer an industry in its own right – the archives industry is poised to take advantage. The Archives profession has brought in people from other professions (including us) to help them to take the next steps, instead of leaving others to take the lead. This bodes well for the future of the profession, the industry and – most importantly – for the archives that we are involved in keeping for the future. With this sort of thinking, I have great hope that archives will not be lost, like tears in the rain. P.S. Of course, we’re on social media via Facebook, Twitter or LinkedIn.